The greatest road trip in America! Check my Part 1 if you haven’t yet. 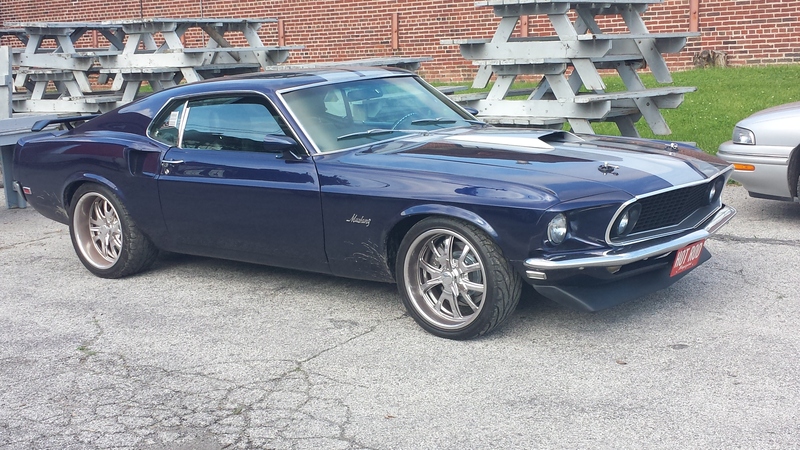 This day started by picking up the parts we had ordered the day before for the Mustang, lower a-arms and front struts. $600 and we were on the road with the rest of the tour. We arrived at Summit Motorsports Park around 3 pm. This was one of the easiest venues to get into. I suppose because they had plenty of room and are set up to handle that many cars? 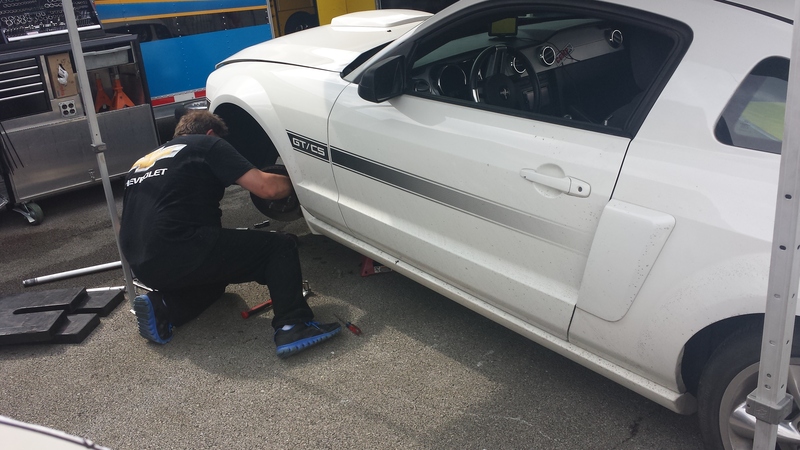 We parked the Mustang by the GM rescue mechanics. As I mentioned before, if you are having serious problems and bring these guys parts and a broken car, they will fix it, no charge! This is my official “Thank You” to those guys! GM mechanics saving our Ford! Great guys! They won’t swap your new cam in! But if your car has brakes fading away, clunky suspension (guilty) or other safety issues they will help in a heart beat. They also were helping some guys with rough running vehicles, etc once they got caught up on the safety stuff. I asked Robbie to watch the car get fixed while I went and got my Golden ticket for the Comp Cams drawing. 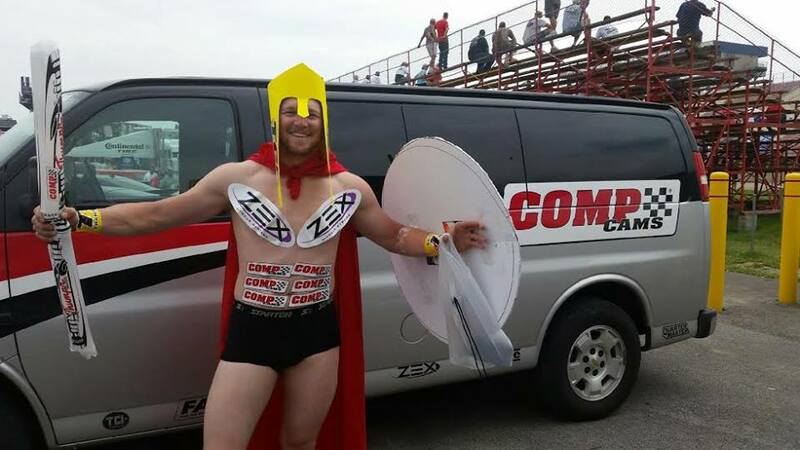 I talked with quite a few folks while walking around in my Spartan outfit. Many people gave me thumbs up and took pictures. A few shook their heads, some asked if I lost a bet, all understandable. One guy I talked to while walking around was David Brown. 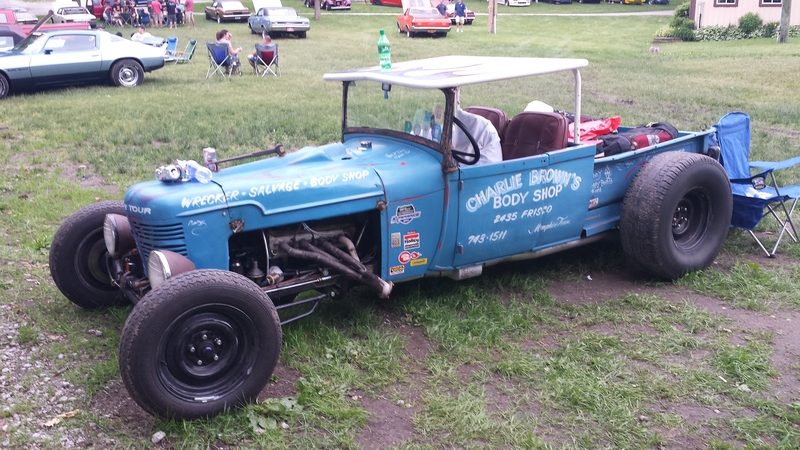 He had 2 vehicles on Power tour, a 1928 Ford and a 1964 Ford, both trucks. David Brown 1964 Ford truck. 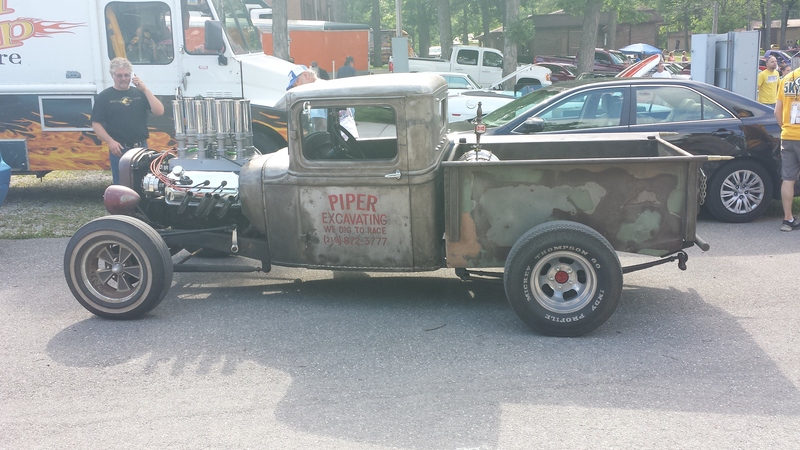 Very cool shop truck style! Once our car got fixed and I received my Golden Ticket we walked around a little. 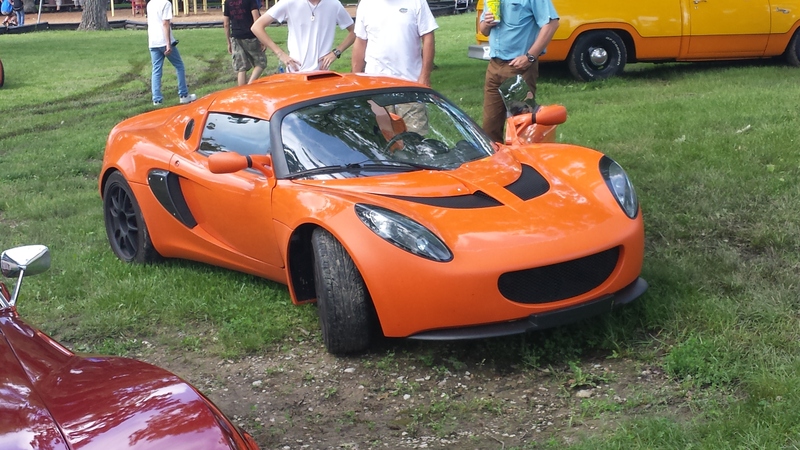 We ran into the guys driving the Evil Atom. They have to at least be in the running for the toughest guys on power tour. 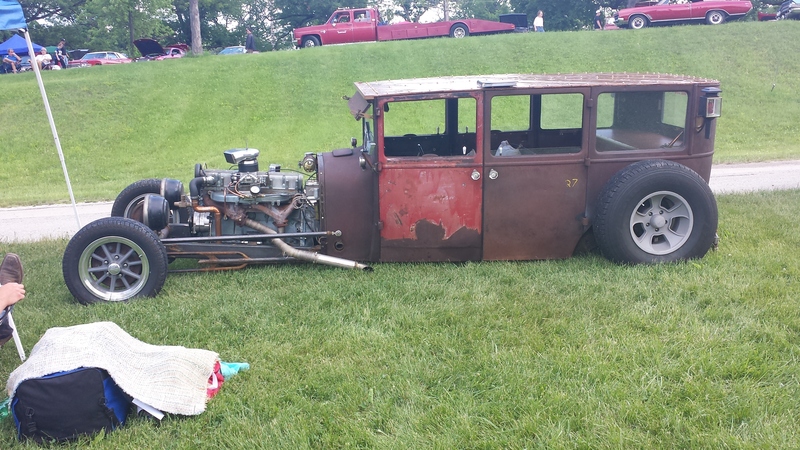 This year was pretty nice weather, but the lack of any roof makes it even tougher to drive (through rain) than most rat rods, and this is something like these guys 6 HRPT. That night we stayed at a small hotel and once again meet some cool folks there. 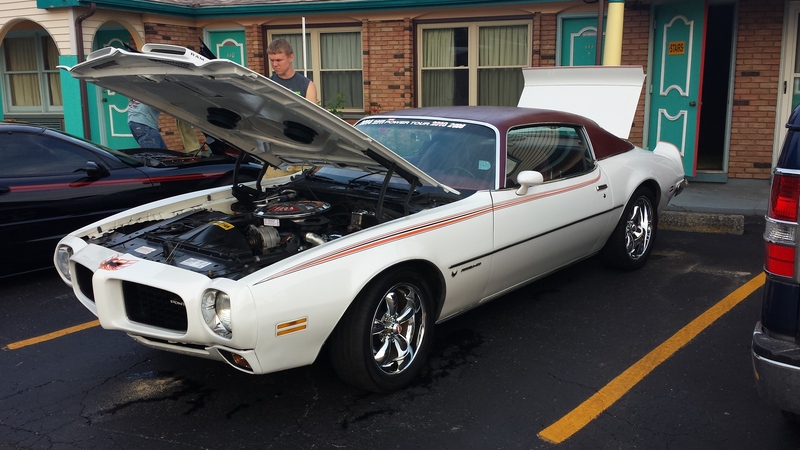 Robert Brown (no relation to David) shared with us his 1973 Firebird. What a clean car! 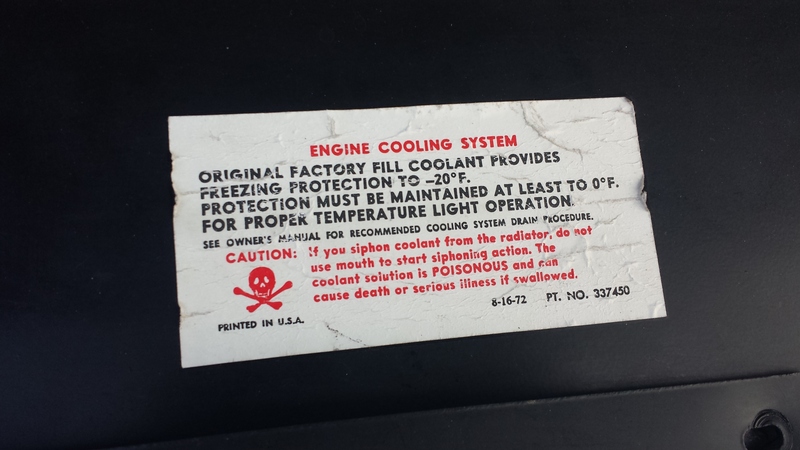 Don’t drink the Kool-aid from the Firebird’s radiator! We arrived at Lake County Fairgrounds in Crown Point, IN around 3 pm. This was a very cool stop! The fairgrounds was a very cool setting, it wasn’t rows of cars, they were parked in between trees, around a lake etc. It made for a nice walk. There were a ton of great cars this day (just like every other day). 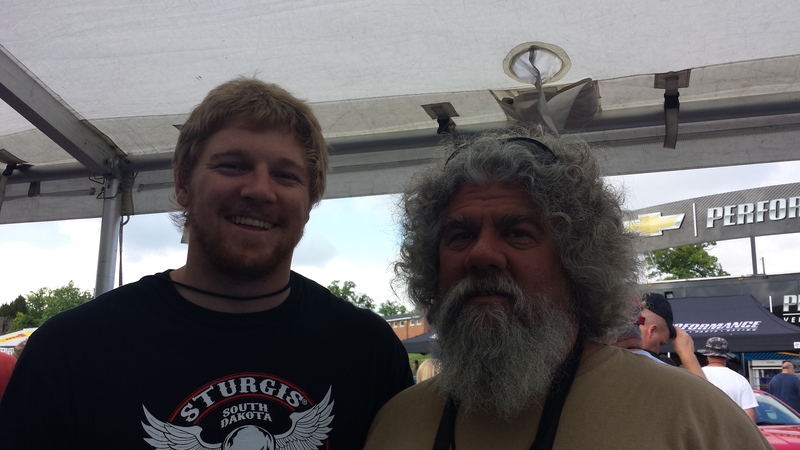 How serendipitous that I had my Sturgis Motorcycle Rally shirt on from last year. After checking in we started walking around the pond. 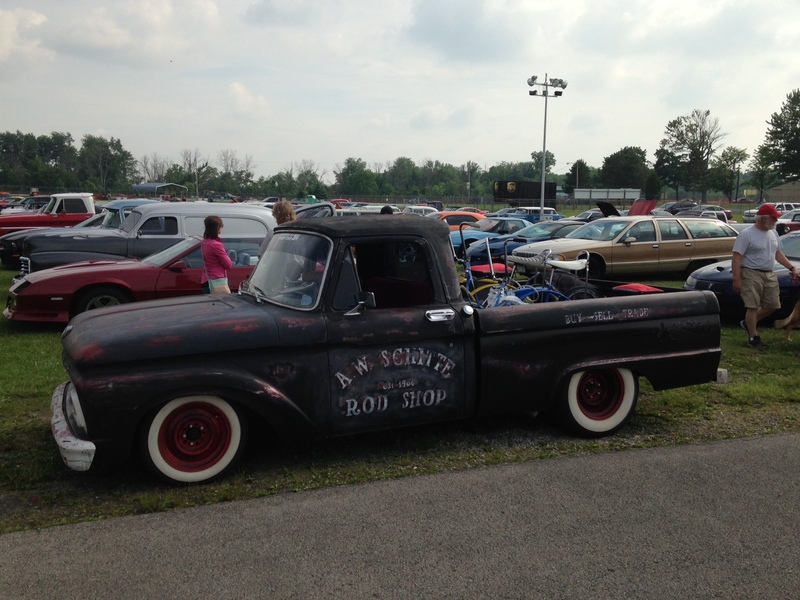 This was where we met a ton of cool Hot Rodders! I had been seeing these “Laid-Back” stickers popping up on everyone’s cars. Shane was putting one on his 1966 Ford with the 7.3 diesel earlier in the week when I met him, and a ton of other vehicles had them on also. I finally took the chance to stop and say to these guys. I talked with Chris Barker at that booth. They had a couple cool woodie wagons there and Batavus scooter. I studied abroad in Holland and this particular model was made in Holland so I am a bit more partial to it than most people. 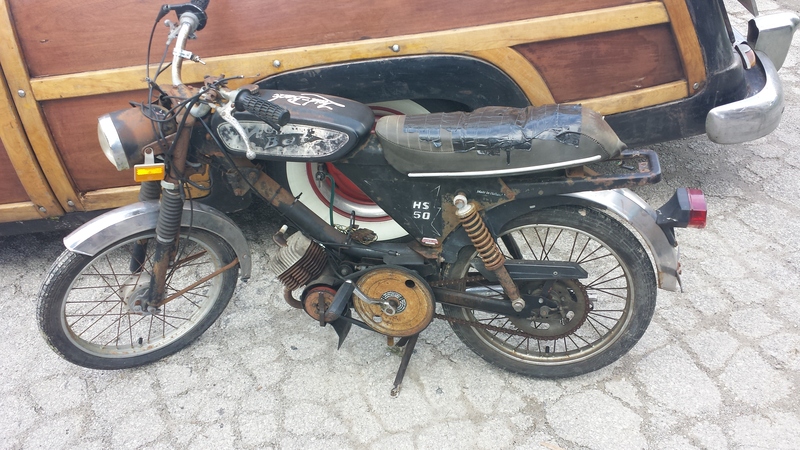 Laid Back scooter/motorcycle. I studied abroad in Holland and this particular model was made in Holland so I am a bit more partial to it than most people. The brand is Batavus. This car was a popular car at every stop. Didn’t get the guys name. This was a very popular car at HRPT. 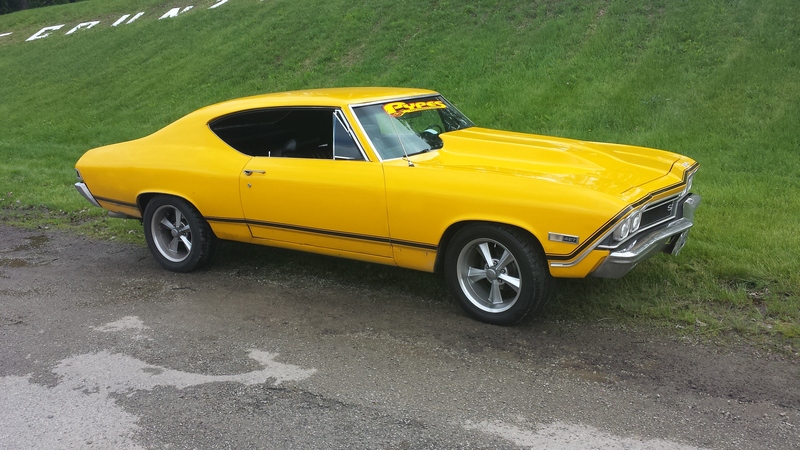 It has a overhead cam Inline 6 cylinder Pontiac engine. Quite the unique power plant! The rest of the car was very unique also. 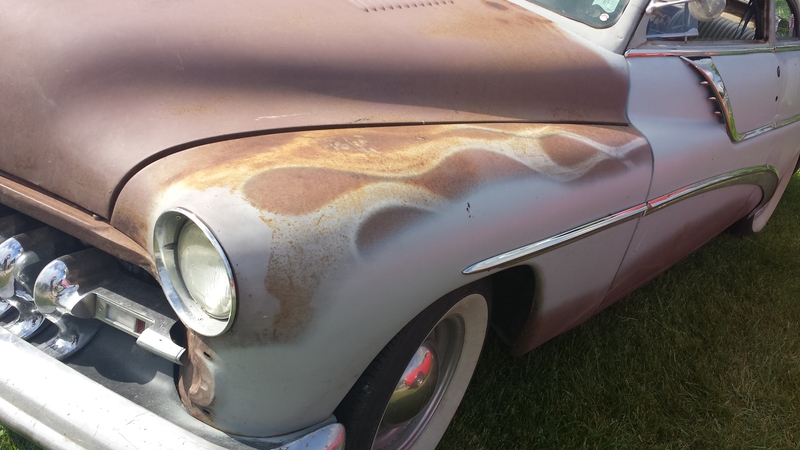 Here’s another vehicle I didn’t get much info on but I thought the rusty flames were pretty neat! The next vehicle I stopped at was the Ring Brothers party camper. These guys build incredible cars. Check out this custom Pantera they recently finished. On the HRPT they were just having fun, I didn’t see any vehicles, besides the party camper, which was pretty awesome! 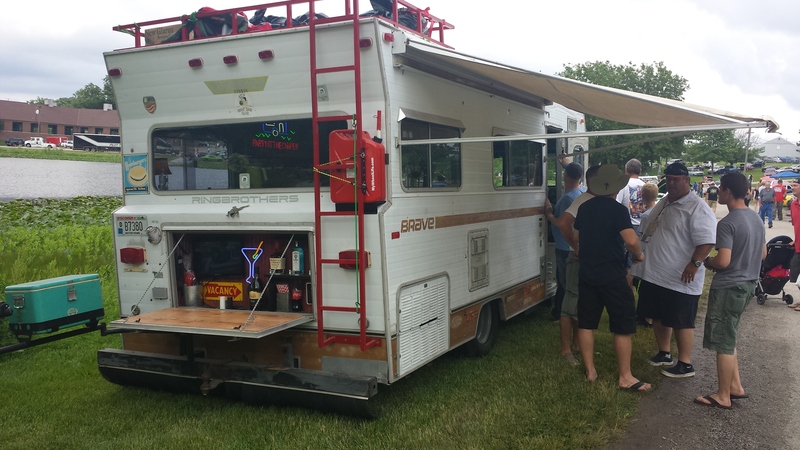 RingBrothers party camper. You see they let me brand their gas tank with a MyWheelLife.com decal. cool guys who build awesome vehicles! Check them out. After them I walked past the dyno, which was at every stop on the power tour. It was a popular attraction every day. 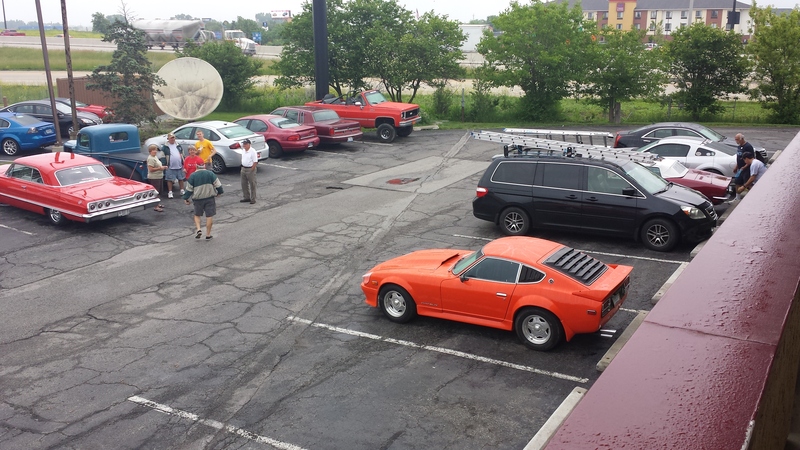 Overlooking the dyno I talked with Ryan of Rusted Knuckles Garage. I was unable to find his website but I did find his youtube channel. Check out the pictures of his truck below. 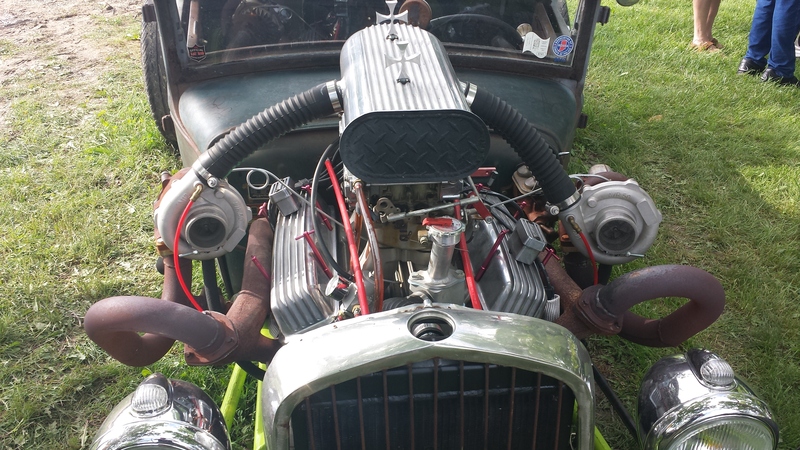 He was running Buick GN turbos from a 3.8 V6 but he had 2 of them on his SBC V8. 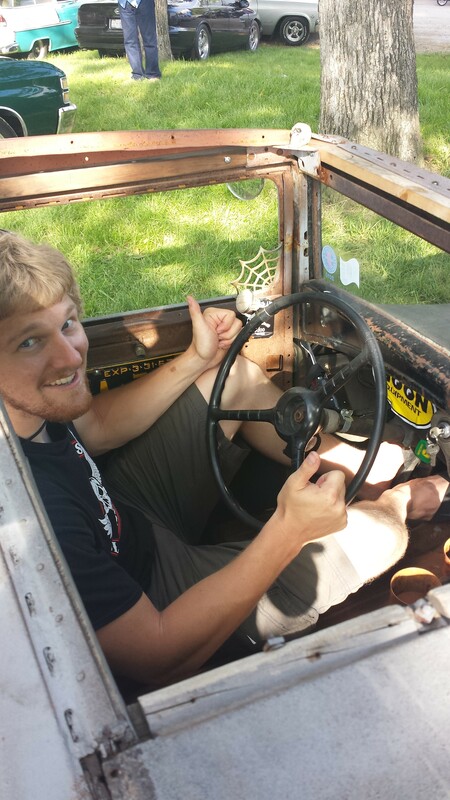 He was nice enough to let me sit in his cool truck. It was awesome but a bit tight for me! The truck is named “Hands Full” because it’s a handful to control all that power when you hit the gas! 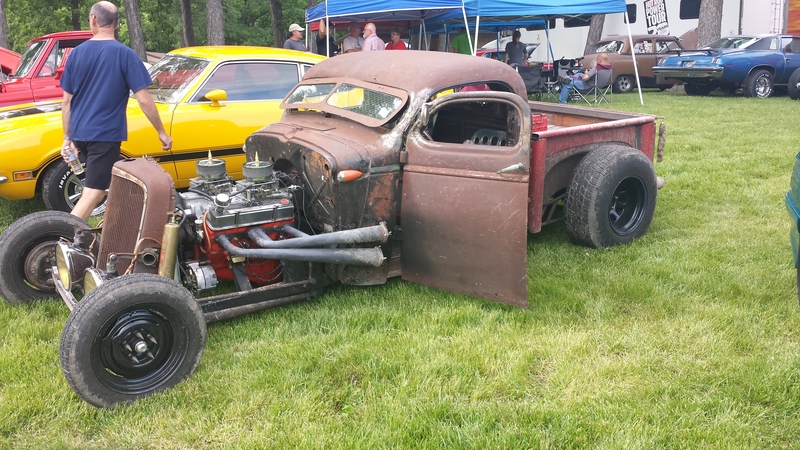 Crazy twin turbo small block Chevrolet rat truck. The turbos were from a Buick Grand National. The Hands Full truck was a pretty tight fit. That’s what happens when you channel a body over the frame. Awesome front view of Hands Full! After Ryan’s truck I ran into another rat. This one was built by Rich of the Hoosier Head Hunters. They were from pretty close by and had brought a few cars. Ryan’s was very cool. If you check out their FB page you can probably get in touch with Ryan. He said the truck was up for sale or trade if you are interested! 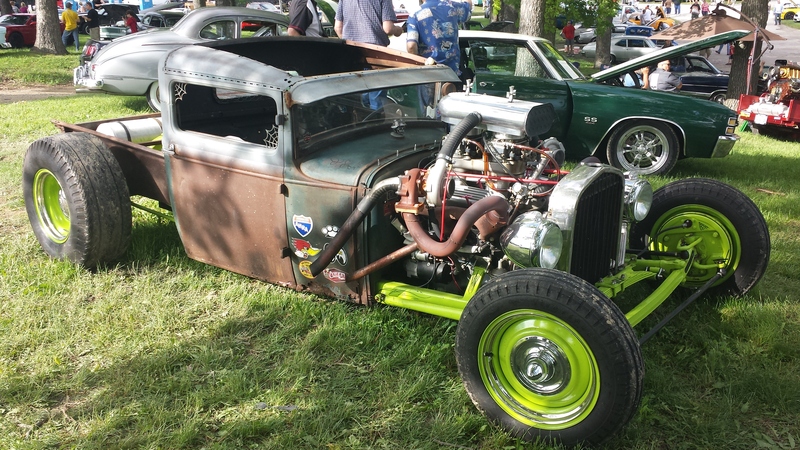 Rich from Hoosier HeadHunters car club from Cedar Lake, IN. 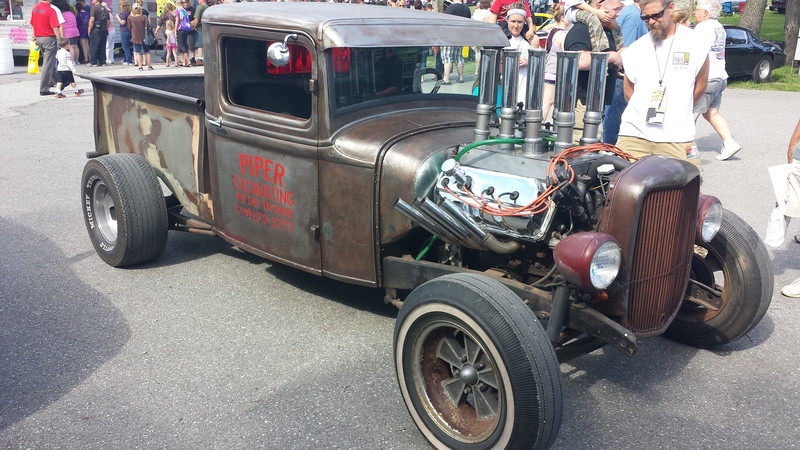 There was one more awesome rat truck I took pictures of that day. Are you starting to feel a trend here? Is there something in the water in Indiana? If there is I hope I got some! 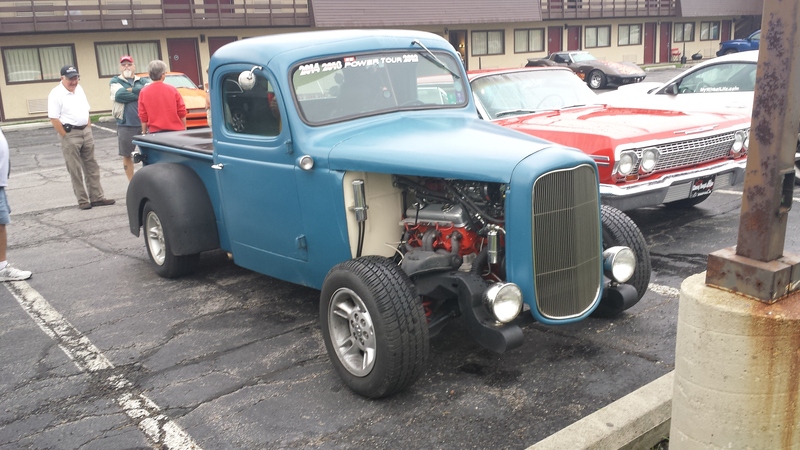 Later that night we stayed at Red Roof Inn and there were a TON of hot rodders there! Here’s a few pictures. One more vehicle that wasn’t a rat! Quite far from it! This just shows the variability of HPRT vehicles which is what makes it so great! 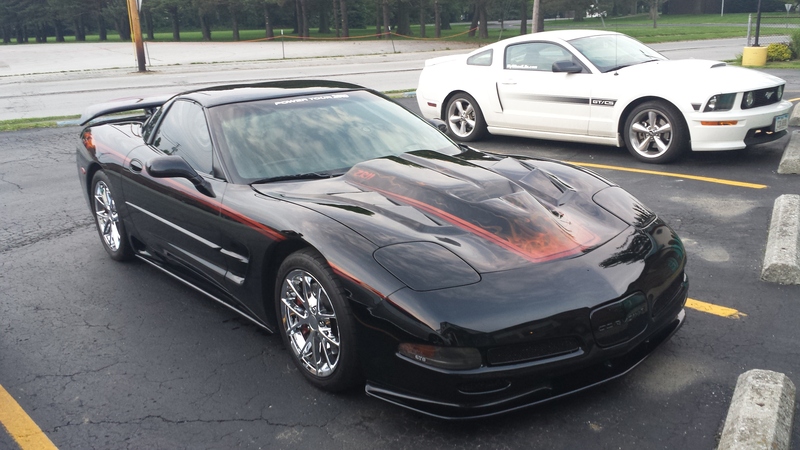 What were your favorite parts of Tuesday/Wednesday of Power Tour 2014 (Norwalk, OH and Crown Point, IN)? What were your favorite cars? 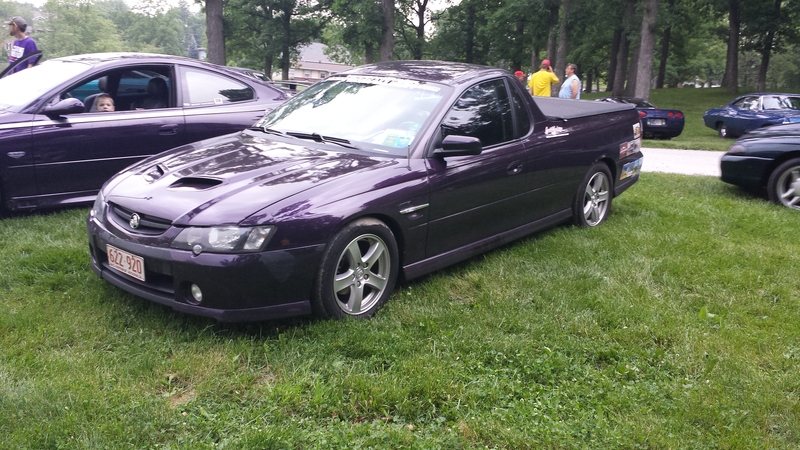 Crazy Holden Ute from Australia? El Camino anyone? 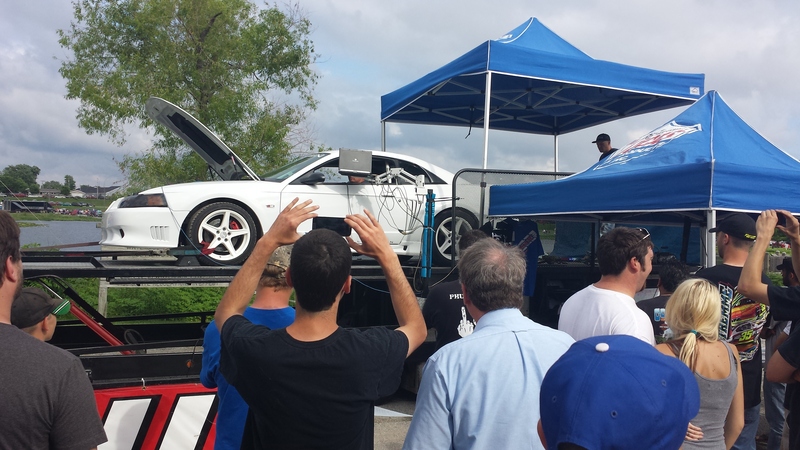 What was the strangest car you saw on HRPT? Did you meet as many cool people as I did? 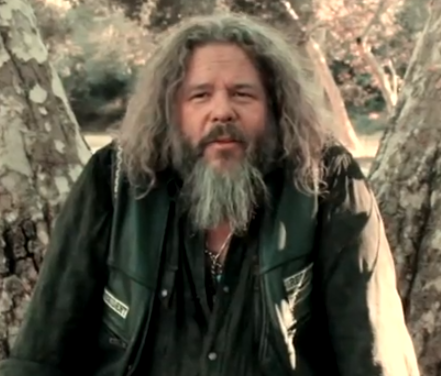 Who was the most interesting person you met? 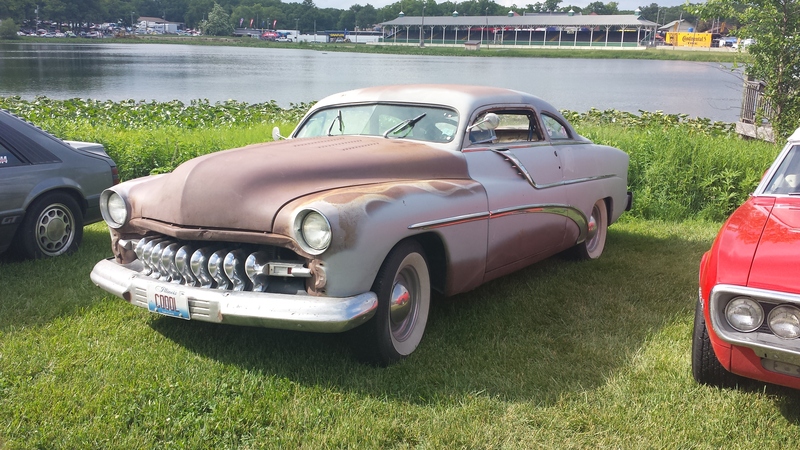 There are a lot more cool stories from HRPT, more cars, more people, more burnouts! So stay tuned! Subscribe, follow on FB, share with your friends, so you get to read the exciting final HRPT 2014 article (probably sometime in the next week or so). Here are all my pictures from HRPT 2014. They are on my FB page.